Discover the charm, wonder and history of Santorini, one of the top destinations in the world, with Marinakis Tours. Let Marinakis Tours, which was founded in 2000, assist you in the most beautiful Santorini experience. Our staff can offer all the essentials of the perfect holiday: exceptional value for money, destination knowledge and attention to detail. The agency generously provides pick up from and to your cruise ship, the airport or your hotel. Let's get started! Your tour begins with a stop at the island's iconic caldera, a striking viewpoint. Enjoy views of staggered cliffs and rock layers dotted with whitewashed houses and blue domes. Then we head to Firostefani for a quick 15' stop, a traditional village filled with many tiny churches, for more insight into the island's history. We gaze the volcano ahead of us, Imerovigli and Oia. The journey continues to Imerovigli where we can see and take pictures of the caves, the place where the old inhabitants of the island used to live. 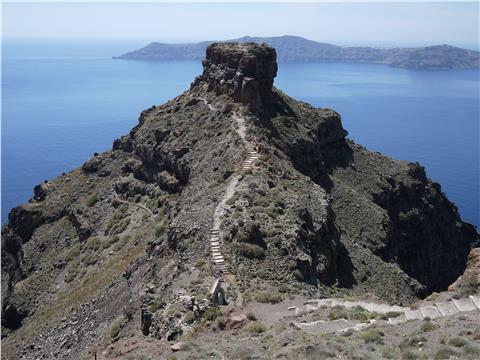 Then, we head to the edge of Imerovigli to see the well-known Skaros, an UNESCO protected mountain that really floats in the air and take pictures of the region. On the way to Oia, we can witness red, black and yellow volcanic lava on the left side of the mini bus. On the right side we see the Caldera and the Aegean Sea and the second volcano of the island, Columbo, which is underwater. Our tour ends at Oia, where we see many old, blue-roofed traditional churches, old houses, traditional coffee shops, boutiques and art galleries and you get the chance to try a bite of the traditional Greek baklava as you drink your coffee. We head to the old Venetian Castle which is located on the edge of the island to admire the beautiful view of Oia and take some time to visit the local shops (optional choice). Then we head back to your hotel or other destination of your choice. Departure point: Your Santorini hotel or meeting point close to the cruise ship port. Departure time: Please advise your preferred departure time or the arrival time of your cruise ship upon booking. Private 4-Hour Tour Book your Santorini custom tour for a duration of 4hours. Visit Fira, Firostefani, Imerovigli, Oia. A great experience!, Excellent!, Well organized!, Wonderful experience!, Our guide was awesome!, A must do. Nice to have half day evenning tour with popular guide. With group of 6 people, everything was well managed to see all hi-li spots. , A great experience! If you cancel at least 7 day(s) in advance of the scheduled date, there is no cancellation fee. If you cancel within 7 day(s) of the scheduled date, there is a 100 percent cancellation fee of the advance payment.